Ribbon Blenders comes with U-shaped trough in horizontal style along with uniquely fabricated agitator in ribbon shape. This agitator is formed with a set of helical agitators both inner and outer. The ribbon in outer side makes movement of materials in specific one way direction while inner ribbon makes movement of materials in opposite direction. SHAKTI ENGINEERING WORKS is one of the leading manufacturers of Rotary Airlock Valve which comes in different sizes ranging from 150 mm to 600 mm. 10,000 liter working capacity Ribbon Blender is manufactured by SHAKTI ENGINEERING WORKS. Ribbon agitators mostly used for blending which will range between 40 and 100% of capacity of blender. 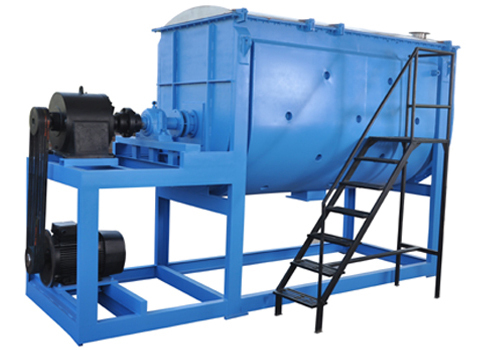 Almost all ribbon blenders is available with an engine to provide power operation, which is large trough for holding material and ribboned agitator which acts for mixing. This type of blender application can be found in different industries for multipurpose needs like mixing material, granual, powder. This entry was posted in ribbon blender and tagged Different Sizes Ribbon Blenders, Ribbon Blenders, Ribbon Blenders Ahmedabad, Ribbon Blenders Manufacturer. Bookmark the permalink.